open space. water in parched land. cliffs and mountains. movement. The Monastery is up a very steep path with approximately 400 steps behind a very large, gleaming building. It was interesting...I turned the corner around the building and suddenly the rush of the busy street, right next to a transportation station and several malls, disappeared entirely. It became very quiet. The path officially starts when the statues start. I think there are more than 500. These are statues of Bhuddist arhats, or saints. Each one was different and there was an interesting variety of faces and positions and expressions. I rather enjoyed that. Some of them have signs that I presume tell you who they are, but that was all in Chinese, probably Cantonese, since that's what's commonly spoken here. The monastery is on two levels. For the most part, you weren't supposed to photograph, so I didn't. However, the main temple houses approximately 12,800 bhuddas, each in a different position, in a room on all sides up to the 30' ceilings. Quite impressive. There are multiple other temple spaces and ancestor halls (I think this is where there are ashes of ancestors and you can come to worship). there are actually some women statues!!!! I finally made it to Hong Kong in Sunday the 15th January 2017 after 36 hours of travel and was wrecked. I spent my first day sleeping, getting a massage and wandering Jenn's neighborhood. A few thoughts about prepping for this trip: it was complicated. My goal was to take as little as possible, have extra room in my suitcase and use absolutely everything. HK is in its coldest month when it averages 50 while Australia and New Zealand are in their hottest time of year. I ended up with layers and a carry-on sized suitcase. We will see how it goes! I'm just going to apologize up front for the weird layouts. I can't seem to force them into doing what I want. The first thing I realized about Hong Kong is that it is so much more than a big city. There are multiple islands and also a piece of mainland. HK practices serious city planning so each area is built to be self-sufficient with markets, malls, theatres, temples, play areas, public transportation, sports grounds and parks. There's actually rural areas and quite a lot of parkland. I took the bus and then the light rail to Sha Tin, another new territories area. Both were clean and easy, well-marked in English (always helpful when you can't read Chinese characters!). I went first to Che Kung Temple, a relatively old temple. This deity was apparently a general who fought bravely and fiercely for his people and has since made miracles happen. HK doesn't seem to be much for the old so a lot of old things are not much more than 100 years even if built on an earlier site. It was pretty busy with worshippers which was interesting since it didn't feel worshipful to me at all. I had to stop and think about different ways of expressing. What I saw was a lot of buying of incense, which was waved in the direction of whichever deity the person wanted to honor. Also a lot of food donations left out--everything from roast chickens and piglets to oranges and handmade pastries. I only took a few pictures here because it felt somewhat invasive to take pictures of people going about their worship. Maybe the thing that felt most odd to me was the business-like aspect to it. After the temple I found my way to Tsang Tai Uk, a walled village. People actually live in the walls and also in the middle where there are courtyards. These were originally built by hakka people, who were mainland Chinese but driven out by wars. They built these fortified places because they were never sure of their welcome. Hakka means guest family. Now the village is surrounded by newer buildings and expressways but still interesting. From there I went to the Hong Kong Heritage Museum, unfortunately closed on Tuesdays, and then to the Newtown Mall. The mall was an experience. A huge, multi-story building, it is connected to at least three other malls, hotels and a transportation center with trains and multiple kinds of buses. Everything was gleaming white, glass and chrome. It was organized kinda like a market--this was interesting--with areas for specific things. Such as there was a watch section with like 7 different brands of watches. A baby section that I think was an entire floor. And so on. In one way I kinda liked that because you can comparison shop easily. And in another it was just odd. There were SO MANY people in there on a Tuesday. Lots of food too. The one saving grace is that there is pretty good signage to help you navigate the mall, because otherwise you could just get lost in a consumer paradise, or hell, as you prefer. I finally made my way out of there and went to the 10,000 Bhudda's Monastery. That's the next post! 3/22: kinda a travel day. I went down through Leitrim to Sligo and stopped at Drumcliffe, where Yeats is buried. He isn't my favorite poet but I stopped to see anyway. Apparently he was extremely fond of western Ireland and who could blame him. I bypassed Sligo town in favor of Carrowmere which was closed and then decided not to climb to Queen Mebh's cairn. I stopped at a darling pottery place, Breeogue Pottery, run by a husband and wife couple. She does stoneware, with delicate and pretty decoration and he is mostly into raku. Hers tends more to functional and his to sculptural. Loved them both. His touch with raku is quite lovely and the incised decorations beautiful. The western coastline of Sligo was beautiful. Definitely a place to consider for a summer holiday with lovely beaches and cute towns. I followed the road west into Mayo, stopping to walk on the beach at Inishcrone. I passed through Ballina which was very pretty if you don't count the terrible traffic (they truly need a bypass so as to make downtown less choked up with one way streets and cars) and stopped Rosserk Abbey on my way to Ballycastle. Loved Rosserk! Right on the water, it is very well preserved. 1400s. It was for 3rd order Franciscans--married people who wanted to be Franciscan. I didn't know such a thing existed. You could climb the steps to the upper outdoor area. 3/23 Mayo all day. 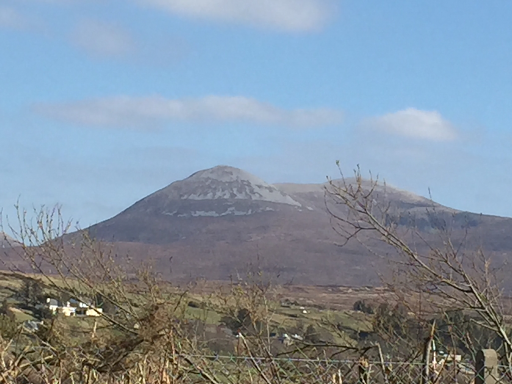 I followed the North Mayo Sculpture trail as best I could. Which wasn't so great as signage and directions were spotty at best. I did see four, maybe five, of the sculptures and a lot of lovely scenery on the way. Also went to Rathfran Abbey, circa 1250, which was a nice ruin but not as nice as Rosserk in spite of billing. What was interesting as that it was no only hard to find but once you did the path was interesting. You went thru two gates and then around the edge of the land right along where you could see the water was at high tide sometimes. The path is only sorta there. Then you come around a corner and there are two more gates to go through to the ruin which is not in as good a shape as Rosserk. 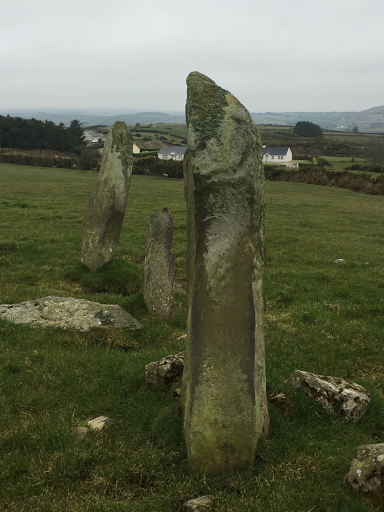 I went down the Mullet peninsula and found another sculpture at the end of the trail which was a take off on the stone circle--a spiral called St Dervla's twist. 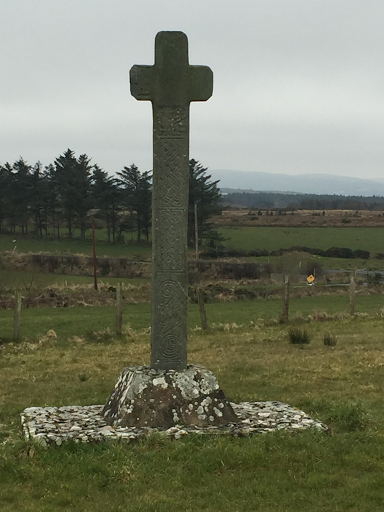 St Dervla is associated very closely with the area as she plucked out her eyes there to convince someone he didn't want to marry her, which turned into a well and when she washed her face her eyes came back, and also founded a church. God does amazing things in this part of the world. I stayed the night in Westport, a very lovely and European little city. 3/24: I left Westport this morning later than I'd hoped because of laundry. Which I might say that everyone must have a washing machine here because there seems to be very few laundromats. I followed a sign for a long time and finally ended up in a gorgeous beach called Silver Strand. It was very deep and the tide seemed very far out. There was a farmer right by the beach when I came out who was chasing sheep around. I'm not clear how he selected which sheep he wanted by but he and a dog herded three out and into a trailer. Then they went back and brought the whole bunch down and chased them into a corner. He then selected one more and pulled it out by running as fast as he could at the herd which scattered, baa-ing, and grabbing the one he wanted by the horns and straddling it. He then lifted it over the fence which could not have been easy and it ran off up the road. He was quite friendly and we chatted a bit--broad Mayo accent. Born and raised on the peninsula, had sheep all his life. They get sheared in July. 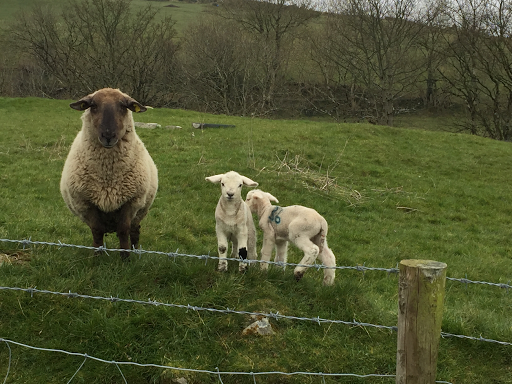 His sheep hadn't had lambs yet because of the cold off the Atlantic. The colors are for identification as they mix with other farmers. He wanted to know why I was traveling alone, where I was from, if I was lost/why I was in this lonely spot, and how I liked Ireland. The Doo Lough Valley came next--probably the wildest place I've been so far. Stark mountains with their toes in the Lough. Gorgeous. Definitely want to come back here. I then went around the Connemara peninsula much too fast. It required at least another day and I had to skip things like the park to make it to the southern part in order to catch a ferry for Inish Oirr, one of the Aran Islands. I did stop at several beaches and take some smaller roads though which in turn made me later than I wanted to be but still in plenty of time. In fact it was probably better as there was nothing to and nowhere to be near the port. The ferry to Inish Oirr also stops at Inish Meain. My spellings might be off and there are missing accents. It's not a huge boat like ferrys in Washington. Maybe the size of a large yacht? Most of it is covered and has seating inside. It's a businesslike piece of work and I'm guessing a lot of the people on it are locals since they are mostly carrying large bags that are more grocery than suitcase like. I hear Irish being spoken. It sounds very liquid and yet also a bit like Hebrew. Photos are on Instagram or Facebook. I started the morning in Letterkenny with pancakes...the first I have seen since I got here. Breakfast seems to be consistently the following: variety of cereals, fruit salad (thankfully banana free), yogurt, toasted (sandwich) and untoasted (usually wheaten bread which is smaller and less consistent than sandwich) bread. Then you can have a full fry or some of those components. A full fry constitutes, for those unsure, eggs, bacon, sausage, grilled tomato, toast. Depending on where you are it can also include one or more of: fried mushrooms, black or white pudding, beans. It's all a bit much really. It's one saving grace is that it is mostly protein and lasts a long time (till dinner). Anyway, I stayed at a nice B&B, an older couple. 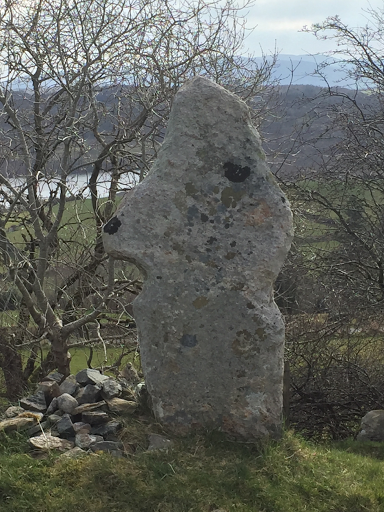 I went first to Doon Well and Stone. The well is a holy well, supposedly blessed by a healer and not dedicated to a saint or Christian. Except when I got there there was a big sign about how to do turas (pilgrimage) and it involved a lot of Hail Marys and the apostle creed. Neither of which I know. And the water was...well let's just say I wasn't touching much less drinking it! Pretty spot though and obviously much trafficked since there were several trees hung about with offerings. Later, at the workhouse museum on something about railways, it mentioned that the railway made trips to the Doon Well easier. I was interested as it is quite a distance for people to have wanted to go on the 1800s. 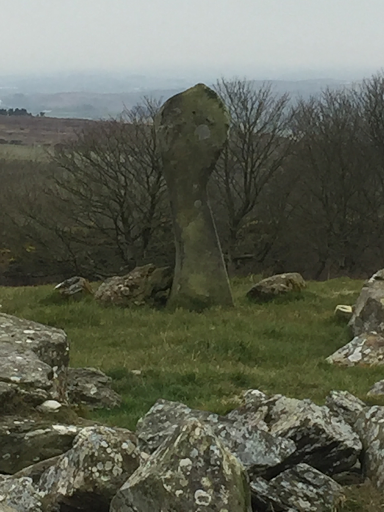 Then I climbed Doon Stone which was used for crowning cheiftains, mostly O'Neills I think. It was a lovely high point from which you got a great view of the countryside (which I didn't photograph since I didn't take my camera). From there I wandered about the area where St Colmcille (Columba in English) was born. He's one of Ireland's great saints, along with Patrick and Brigid. 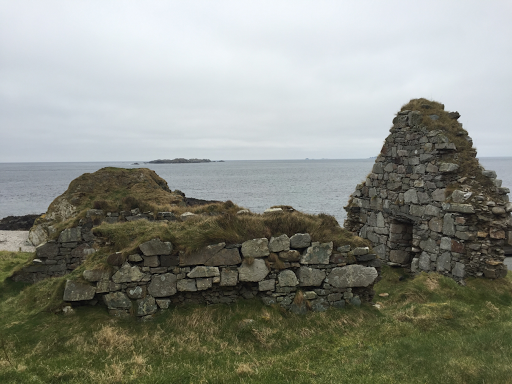 He also founded the important monastery on Iona, a Scottish island. Anyway, I spent a long time drawing the cross at one of his first monasteries by his home and then the church wall. I'm fascinated by the dry stone building and the lovely way it goes together. Also the doorway is no taller than I am at its highest point. No, it's not snow on top. 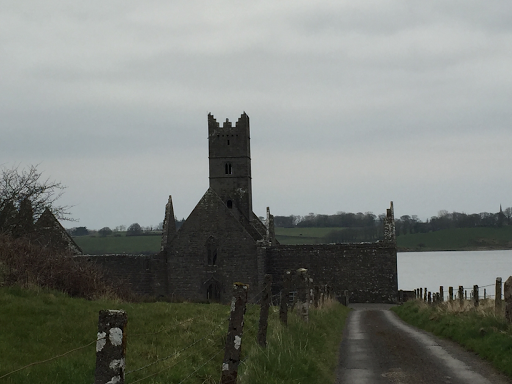 I next came over a hill to a valley where I could immediately see a lake and a ruined church. The turn was also good for the Poisoned Glen, supposedly poisoned when Balor, a one-eyed king of Tory, was killed. His eye spilled poison on the Glen. More prosaically, it was a cartographers mistake--they change one letter of the Irish name and went from heavenly to poisoned. It was a very rocky place between arid looking mountains with a lovely stream running through it. The old church was quite picturesque and I spent a lot of time drawing it too. It's a Church of Ireland church which was building mid 1800s and in 1955 the roof was removed as there was not enough people for the congregation. The graveyard is still in use though. When I got to the coast, I went to a museum in an old workhouse to learn more about the famine and workhouses. Extremely sad and brutal history. Workhouses did feed and clothe you but they were terrible places to live and separated families, even babies. 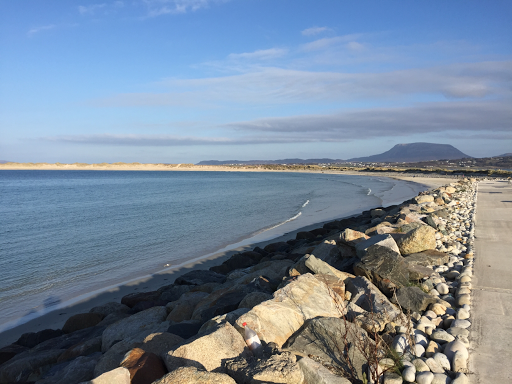 Driving down the coast I circled the Gweedore peninsula, stopping at Magheraroarty beach. This is also where the Tory Island ferry goes from. It's a lovely long beach, which makes a sweeping curve around the bay and bends out towards Inishboffin island. I hear (from a lovely lady who chatted with me) that Inishboffin is even prettier than Tory but harder to get to as no one lives there year round. In spite of my best intentions I did not manage to make it out if Donegal today. The Glencolmcille peninsula proved to be quite fantastically beautiful and interesting. I heard Gaelic spoken! Lovely and musical. The peninsula is all mountains and ocean, quite rugged and remote. It's getting more tourists now because of the Wild Atlantic Way which is a new scenic route that runs the length of the western side. There's a fantastic folk museum in Glencolmcille. What I especially loved about it was that it focused on the common people's experience and living circumstances. There were 5 cottages from different time periods and that belonged to different types of people (farmers, fishermen) along with a wealth of implements, mostly donated from the community but in quite good shape. They have developed some good material about it as well. Living circumstances were quite harsh--although the cottage walls were thick I doubt they were very warm. All were thatched in the traditional way. Life was sparse--they had very little. And yet it seems it was sufficient because there has been life on that peninsula for millennia--it has numerous archaeological finds and cairns and so on dating back to the Bronze Age. Lovely spot with beautiful beaches (too bad it was cold!). Next time I come I will try to stay awhile. Although the peninsula does lack accommodation and restaurants. Interesting thought--we talk about food deserts in the US. Most of Ireland could be considered a food desert--I can't count how many villages I've been thru with only a pub. Not that it's far to somewhere else, but usually not walking distance either. Even slightly larger towns won't have much. I'm losing track of right from left. I don't think I realized how much I depended on driving and cars for that. Now I have to think about my writing hand. It's an interesting disorientation. 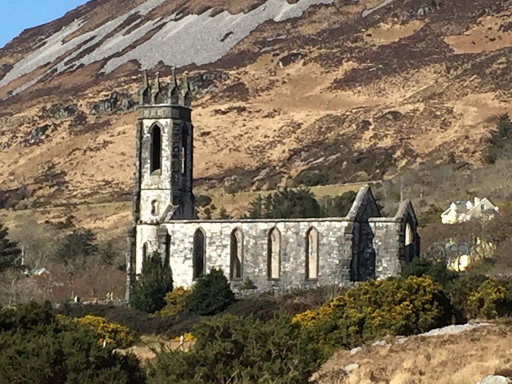 Religion: Ireland has a zillion churches, both Catholic and Anglican. And of course an immensely rich religious history, both pagan and Christian. What's interesting is that in the republic I have seen precisely one church that might be more evangelical in nature. No religious signage. No one seems to care in the republic. However, in the north, I suddenly started seeing signs of religious activity that looks more like what you see in the US: signs with scripture, more evangelical, fellowship type worship places. And of course, in the north, everyone cares a great deal which church you belong to. Gravestones don't give birthdates but rather age and date of death. And are often used for whole families like from 1800s forward. I can't tell if a lot of people are cremated and then use the same grave or what's happening. The whole of Ireland is quite park-like. When you think people have been living here since 9000 years BC you kinda see why. 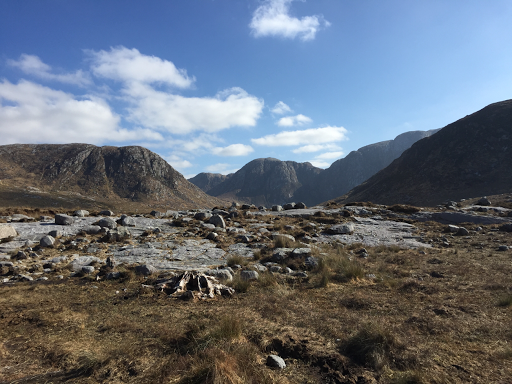 Here's s list of wilder places so far: Glenveagh park, Malin Head, the Glencolmcille area, Urris mountains. I'm guessing there will be more in Connacht. Music seems to mostly start very late at night (10ish) and be played in noisy, crowded pubs. Which is why I am not seeing so much of it. Mostly I'm pretty tired after a day of driving and hiking about. Plus pubs are dark so I don't particularly want to sit about in one for an hour or two after dinner waiting for music to start. Although good conversation sometimes. Both of those were from the Bocan Stone Circle. Really more oval, only about 8 stones still stand. 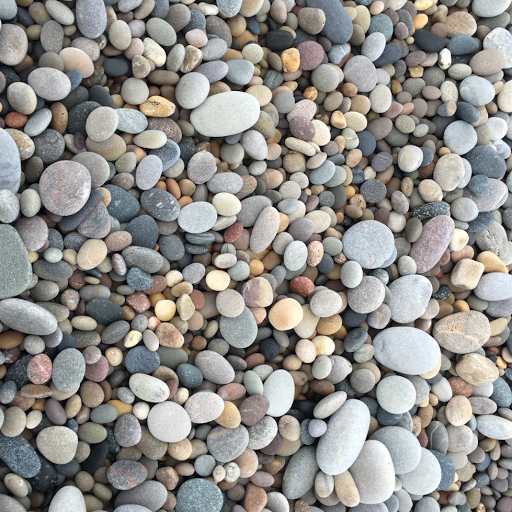 The rough outline is there will smaller stones. 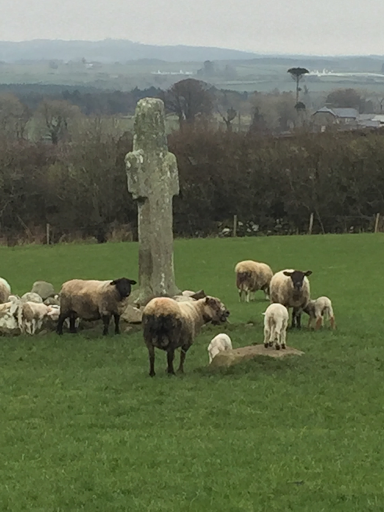 I think some of the stones were purloined for the Clonca church high cross and lintels. This family seemed quite sure I was there to photograph them. 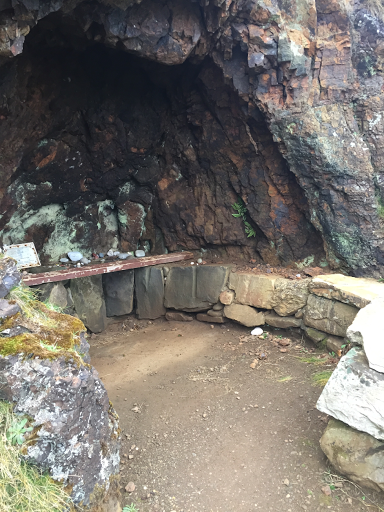 I picked up a bunch before finding the wee house of Malin, which is a ruined church, a cave which a hermit is said to have lived in but which also always has room for one more no matter how many people go in it, and also had a pilgrimage site and a holy well. Personally I would've selected a cave with a bit more protection from the elements to live in, especially since the sea is only a few yards away. I do not claim to be as committed to a life of poverty, solitude and hardship as the early Irish hermits. I picked up a bunch.